Photos courtesy of Mark Garvin Photography. Two actors portray over 25 characters with boundless energy and numerous action figures in the tale of Jason and his crew as they journey to the other side of the world to bring home the Golden Fleece! 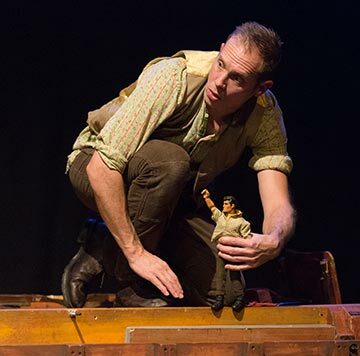 People’s Light presents the Scottish company Visible Fictions’ production of Jason and the Argonauts running March 12th through April 4th 2015. Douglas Irvine directs. Visible Fictions arrives at People’s Light in this “sly, silly, sophisticated, and altogether winning take on an ancient Greek myth” (The New York Times). Two actors portray over 25 characters with boundless energy and numerous action figures in the tale of Jason and his crew as they journey to the other side of the world to bring home the Golden Fleece. The production is aimed at anyone from age 9 and beyond and is guaranteed to entertain kids as well as adults with fond memories of the original book and film. Douglas Irvine, Visible Fictions’ Artistic Director said “I’ve never forgotten the thrill of seeing the Harryhausen film version for the first time as a child. The purity, inventiveness, thrills and scares it and the original story offer is something I want to pass onto new audiences.” Visible Fictions is recognized in the UK and internationally for creating innovative and dynamic theatrical productions for young people. Since 2006, the show has toured the UK, Canada, Australia, and the U.S. (including New Victory Theatre in New York). Join the artists after each performance to discuss the making of the production. Enjoy a prix fixe dinner and a show package for $73 (Wed, Thurs, Sat matinee, Sun eve) and $82 (Fri, Sat eve, Sun matinee) at The Farmhouse Bistro prior to Wed-Sun evening performances. That’s a savings of up to 15% off the single ticket price! If you already have tickets, you can add dinner for just $37 (children up to 16 years of age are $16). Dinner and a show packages are available through the box office or online at PeoplesLight.org. 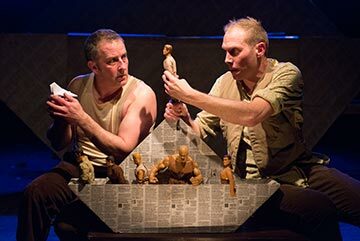 Jason and the Argonauts previews on Thursday, March 12th at 7 pm and Friday, March 13th at 7 pm. The play opens on Saturday, March 14th and runs through Sunday, April 4th. Single tickets start at $27. For tickets, call the Box Office at 610.644.3500. Special discounts are available for groups of 10 or more. For more information or to purchase group tickets, call 610.647.1900 x111 or email benedict@peopleslight.org. Three-play packages are still available for the 2014-2015 season and start at $99. Productions include Jason and the Argonauts (March 12-April 4, 2015), Biloxi Blues (April 29-May 24, 2015), How to Write A New Book for the Bible (June 3-28, 2015), and Stella & Lou (July 15-August 23, 2015). Visit peopleslight.org or call 610-644-3500 to order. Actors, prices, productions, performance dates and times are subject to change. Additional service charges will apply. Contact the Box Office for more details. People’s Light is located at 39 Conestoga Road, Malvern, PA 19355. For tickets call 610.644.3500 or visit peopleslight.org.